Today's Observer newspaper in Britain carries an article about TJN's new report on taxing transnational companies, in which Professor Sol Picciotto makes the case for shifting to unitary taxation with profits being apportioned to the various countries in which the TNCs have a genuine economic presence. Sol's report is available in full here and you can download the press release here. The Tax Justice Network on Sunday 9th December will unveil a blueprint for a 21st century system for taxing multinational companies to replace the current outdated and thoroughly discredited model. Rampant international corporate tax abuse means it is now beyond doubt that many of the governing principles underpinning international tax are fundamentally flawed. In the face of rising public anger, governments are promising to fix the problems, but their proposals so far involve trying to patch up an outdated international system that is beyond repair. Failings built into the current system let large multinationals avoid hundreds of billions of dollars in tax. Thanks to their tax subsidies, multinationals out-compete smaller locally-based rivals. This has nothing to do with genuine economic efficiency or productivity. They are killing off their smaller rivals in markets, and at the same time free riding on the tax-funded benefits provided by the societies where they operate, letting others pick up the tab. As politicians scramble to placate the public at the sheer size of tax dodging by all sectors of international business including global extractive, finance and new technology firms, TJN today publishes, Towards Unitary Taxation of Transnational Corporations by Sol Picciotto, emeritus professor at Lancaster University and senior adviser with Tax Justice Network. Towards Unitary Taxation of Transnational Corporations is a roadmap outlining a complete and managed overhaul of international system of corporation tax. There is, we believe, no alternative to wholesale reform of multinational taxation. The status quo, left unchecked, will foment increased economic and social dislocation. 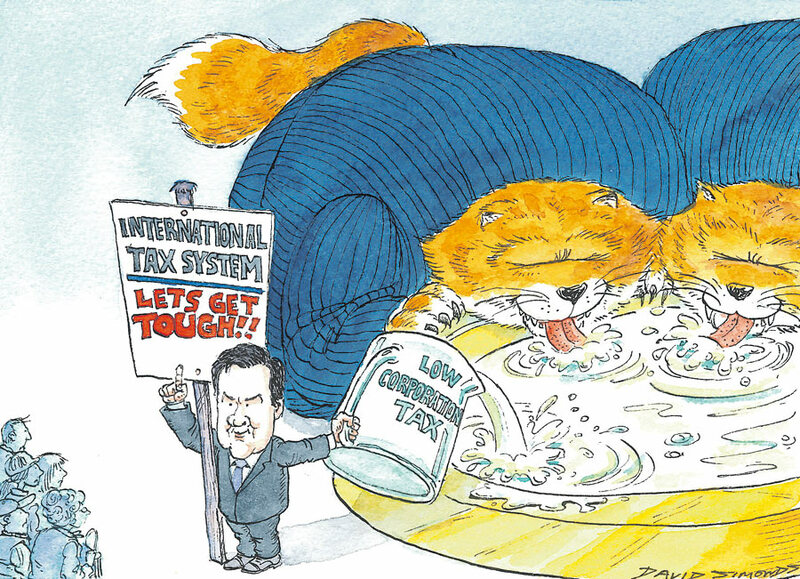 “George Osborne claims that the UK is taking the lead in looking for ways to deal with tax avoidance by TNCs. Yet British officials have consistently opposed examining the necessary fundamental reforms, especially unitary taxation, both in the European Union and worldwide. If Osborne is serious, he must now back the necessary reforms to what is clearly an unworkable system. Today’s international tax rules, which were drawn up nearly a century ago, have not kept pace with the massive changes in the world economy. The system is governed by two broad principles. First, it treats transnational corporations (TNCs) as if they were loose collections of separate entities operating in different countries. Because there is only weak co-ordination between tax authorities, however, this ‘separate entity’ approach allows TNCs scope to shift profits around the globe to escape tax. Second, entities within a multinational trade with each other across borders at prices governed by the so-called Arm’s Length Principle (ALP) – as if they were independent actors trading with each other in the open market. Yet TNCs enjoy unique global synergies and advantages that come from combining economic activities on a large scale and in different locations. These advantages cannot be attributed to a single location, but to the whole global entity. So treating each affiliate as a separate entity for tax purposes is impractical and does not reflect economic reality; and their internal cross-border trades typically bear no relation to any supposed “arm’s length” trade between independent actors in an open market. It is, as a top U.S. tax expert puts it, “delusional” to think this principle can be applied effectively. This international tax system is dominated by the Organisation of Economic Cooperation and Development (OECD). The OECD’s Fiscal Committee, consisting of unelected state officials, presides over an increasingly complex set of rules which they are also responsible for applying. Its often arbitrary decisions involve billions of dollars of taxes – yet it is effectively unaccountable. This press release introduces a new report, Towards Unitary Taxation of Transnational Corporations by Sol Picciotto, emeritus professor at Lancaster University, senior adviser with Tax Justice Network and author of International Business Taxation (1992), and Regulating Global Corporate Capitalism (2011). A historical section charts how the international tax rules, despite significant opposition and viable alternatives, were established in the early 20th century, at a time when TNCs were in their infancy and loans were the main form of international investment. As TNCs became more dominant in the second half of the century, however, they increasingly took advantage of the ‘separate entity’ principle to set up affiliates in convenient low-tax jurisdictions (tax havens,) to cut their taxes. In response, increasingly diverse and complex and rules have been elaborated to patch up the system, which has consequently become ever more arbitrary and opaque. Many experts now argue that a fresh approach is needed, starting from a recognition that TNCs are not loose collections of separate entities but operate as integrated businesses under central direction. This approach, which a majority of U.S. states (and many others) already use successfully, is known as Unitary Taxation. It is time for a system fit for the 21st Century to be rolled out internationally. The paper outlines how the change could be phased in quite quickly. Instead of the current system where multinationals are taxed according to the legal forms that their tax advisers conjure up for them, unitary taxation would see TNCs being taxed according to the genuine economic substance of what they do and where they do it. This not only fits economic reality and is a far more legitimate basis for international tax, but it is much simpler to administer, a particular benefit for developing countries. It would massively reduce tax abuse and dramatically curb TNCs’ use of tax havens, thus removing much of the political cover protecting these secretive jurisdictions, and consequently making them easier to deal with on secrecy and a wide range of other issues. Under unitary taxation a TNC engaged in a unified business submits a single set of worldwide combined or consolidated accounts, in each country where it has a business presence. This overall global profit is then apportioned to the various countries, using a formula that reflects the TNC’s genuine economic presence in each country. This allocation is often called ‘formulary apportionment’ or, much better, ‘profit apportionment’. (The formula typically considers the TNC’s assets, labour and sales in each jurisdiction.) Each country involved sees the combined report and can then tax its portion of the global profits at its own rate. Widespread international co-ordination is not necessary for this to work, though it would help. Unitary taxation would place on a sounder basis the `territorial’ principle, where profits are supposed to be taxed by the countries in which the business activity takes place. This apportionment would be done according to factors measuring real economic presence in each territory, rather than according to the fictional devices and entities devised by the fertile minds of highly paid lawyers and tax advisers. Tax experts have long known that this unitary approach makes more sense. It has long been applied in federal systems, notably in the United States: a pioneer was the State of California which was missing out on revenues thanks to Hollywood film studios siphoning profits through their use of Nevada incorporated affiliates. But the approach has not yet been rolled out internationally. Indeed it has not even been seriously studied by the closed groups of tax specialists running the system. Powerful vested interests support the current system. Even in the 1930s when the “separate entity” approach was first agreed internationally it was accepted that in practice national authorities could look at the firm’s overall financial accounts in order to ensure a fair split of the total profits. However, this was never done in a systematic way but through this increasingly complex array of often ad hoc, unworkable methods. Some techniques allowed by the OECD already go a fair way towards profit apportionment, the basis for unitary taxation. Indeed, the European Union has already prepared proposals for adopting a version of unitary taxation, though with a restricted scope. a requirement by countries that transnational companies publish full trading information – a Combined Report - to eliminate abusive transfer pricing and profit shifting. one or more major international trading blocs adopting the change. The EU project could be the first. Its scope could be steadily expanded. The OECD has for decades stubbornly refused even to consider the viability of the approach, strongly influenced by lobbying, such as in a campaign led by British TNCs in the early 1980s against worldwide profit apportionment by US states, especially California. The system is also defended by a large and growing avoidance industry including the Big Four accounting firms, which derive large fees helping TNCs navigate the increasingly complex arena of international tax. TNCs defend what they know is a dysfunctional system, because it helps them avoid tax. The OECD Committee, for its part, consists of national tax officials working closely with private sector tax specialists and advisers from large accounting firms with a vested interest in the status quo. Officials often leave public service to take up lucrative private sector jobs, in a revolving door; each has invested huge intellectual capital in understanding the complex rules they helped devise - so they are understandably reluctant to reform the system. The OECD says its Arm’s Length Principle (ALP) expresses an international consensus and deploys it to close down debate elsewhere, especially in the UN Tax Committee, which is potentially an alternative forum for setting international tax rules. Developing countries hope to tackle TNCs’ international tax strategies, but they find the ALP difficult or impossible to administer in practice. India has 3,000 cases challenging transfer pricing adjustment pending before its tax courts. Brazil has modified the rules in ways the OECD disapproves of. China is taking a similarly independent-minded approach. Persisting with this failing system of rising complexity is a recipe for international conflict. Meanwhile, banks and other financial firms are the main users of the tax haven system: their systematic tax avoidance, by reducing their cost of capital, significantly contributed to the liquidity that fuelled the speculative bubble which resulted in the financial crash. Until now, tax authorities have not pushed for a unitary approach because they have felt that political will is lacking. So instead they take upon themselves the responsibility for deciding, on a case-by-case basis, how each large company gets taxed. That political will is now within reach. The time has come to reform international tax for the modern era. • It is impossible to calculate the amount of money multinationals avoid globally not least because there is no agreement over what constitutes avoidance. In the UK, the TUC estimated 700 of the largest corporations avoid tax worth £13bn. • This approach has been widely endorsed. See Sol Picciotto and Nicholas Shaxson recently in the Financial Times. See Respected finance thinker John Kay, also in the Financial Times, who commented: “The repeated revelations that many major companies pay little or no tax, even if they do so by legal means, fuels a public sense that tax is mainly for little people. We need only look at Greece to see how socially, politically and economically corrosive that perception can be. . . . Well conceived apportionment is the best – perhaps only – answer to the problem presented by multiple company tax jurisdictions.” See also this FT editorial, also endorsing the concept. • Please click here for a series of quotes about the scale of tax abuse through TNC’s use of transfer pricing. Common Consolidated Corporate Tax Base, or CCCTB, currently under consideration by the European Council.